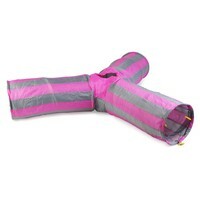 Ancol Acticat Y-Shaped Cat Tunnel is a durable play tunnel for cat's that like to stalk and pounce. Made from a tough crinkle material, the tunnel has an irresistible fluffy toy hanging from the central 'pounce hole'. Your cat will simply love pouncing into and out of this Y-Shaped tunnel, and when they begin stalking who knows which hole they'll appear from! Hours of fun to be had for both you and your cat. Folds flat for easy and convenient storage. Excellent product, very well made, much better than others on the market. My Siamese loves it!